Deloitte recently published a paper, Tracking the Trends, on the top 10 issues mining companies may face in the coming year. In the paper, Deloitte offers a variety of solutions to assist with these issues. 8 of the 10 issues they listed involved data analytics/monitoring as a solution. 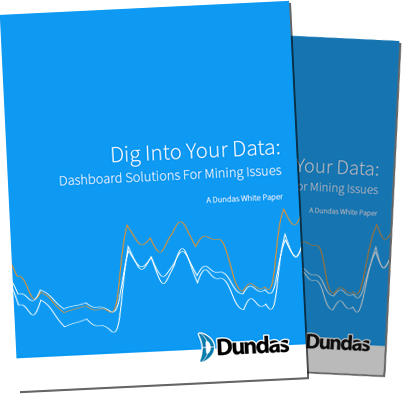 As dashboards typically provide the presentation layer to data analysis, they are vital to improving mining operations. This paper will explore those challenges and discuss the role dashboards can play in solving them. What exactly is a Dashboard? Download White Paper Sign Up Below! I consent to receive commercial electronic messages from Dundas regarding products, services, updates and other information about Dundas. You can withdraw your consent at any time. Dundas Data Visualization is a world leader in advanced data visualization and business dashboard solutions. In addition to Dashboard solutions, Dundas also offers a professional services group that specializes in comprehensive dashboard consulting, product enhancement and training. © 1999-2013 Dundas Data Visualization, Inc.